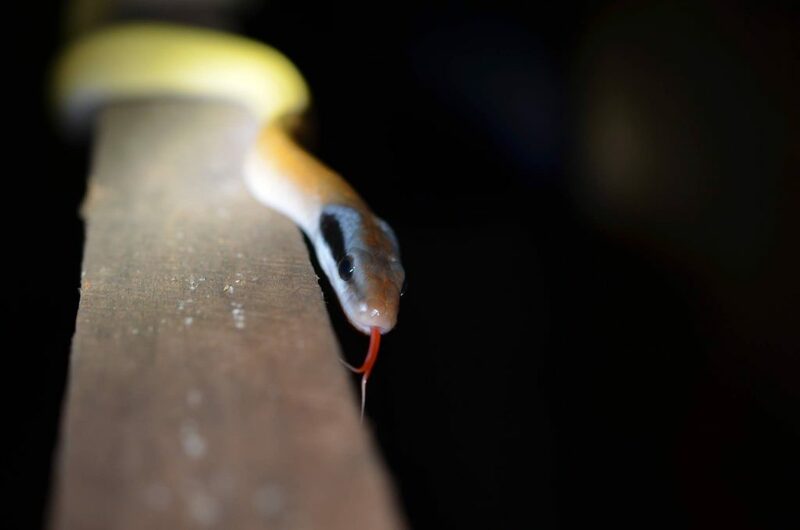 Second page of Thailand Snake gallery images. 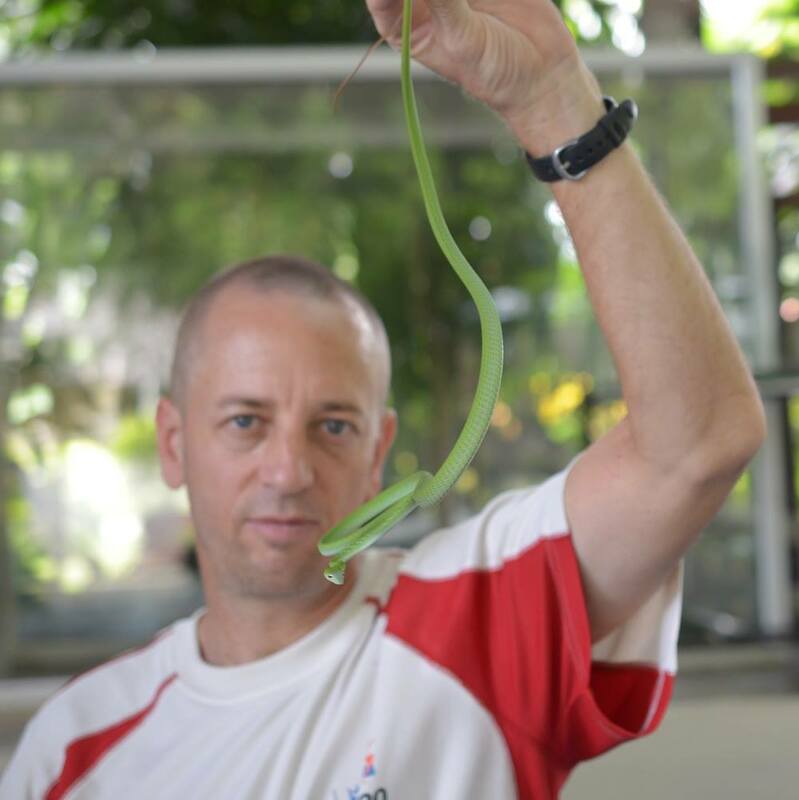 Vern with red-headed krait – deadly and rare. 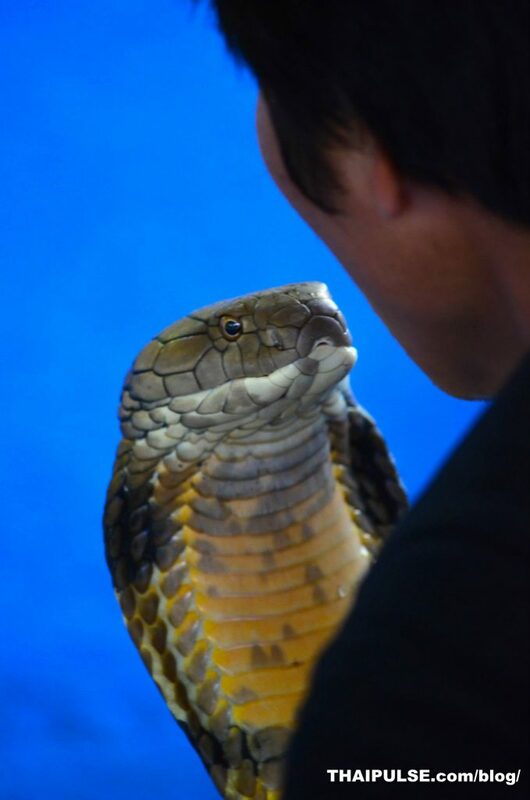 You’d have to be a little nuts to get this close to a king cobra. 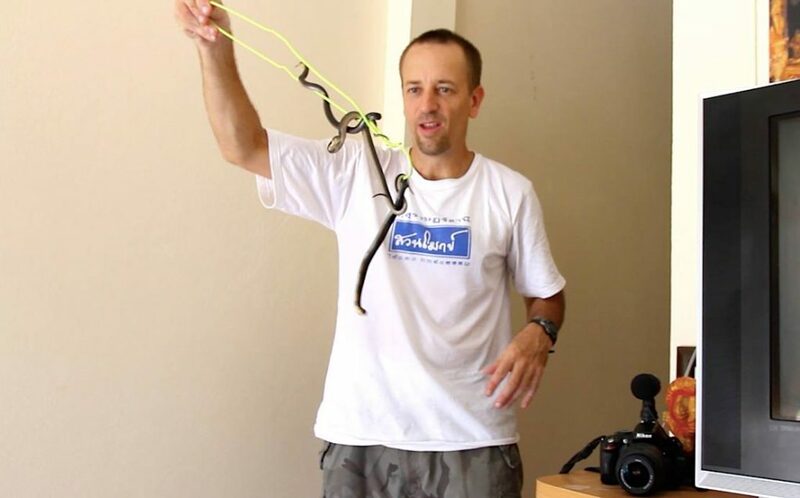 Catching monocled cobras in my friend’s house (a video on Youtube). 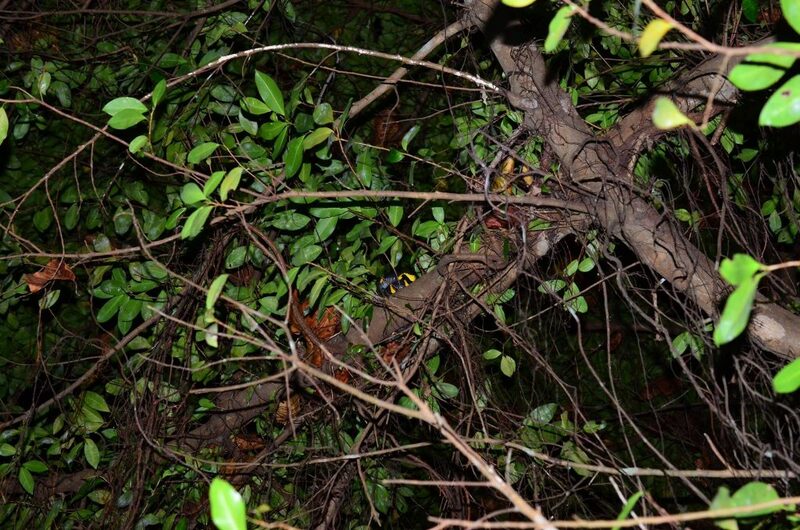 Find the snake and guess the species (Ahaetulla prasina). 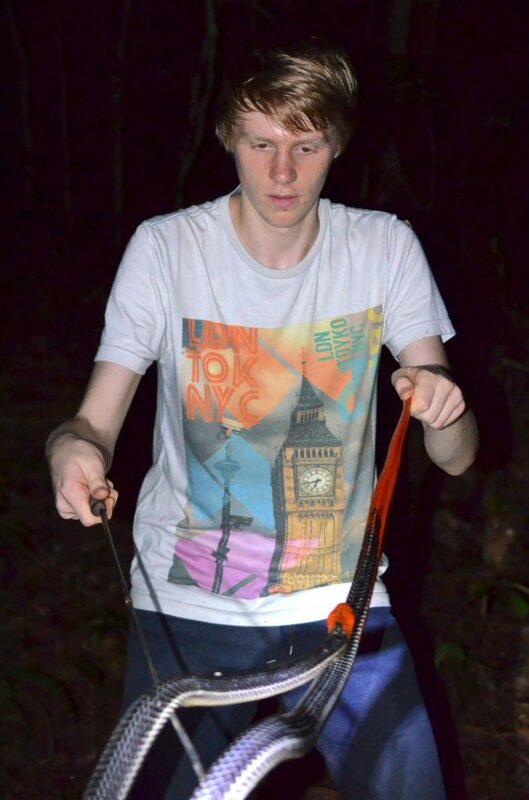 Elliot from the UK with a wolf snake while herping Krabi Thailand with us for a couple of nights. 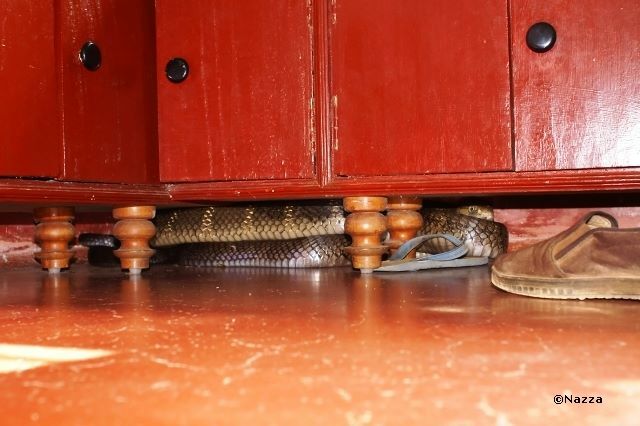 King cobra under the kitchen counter… who you going to call? 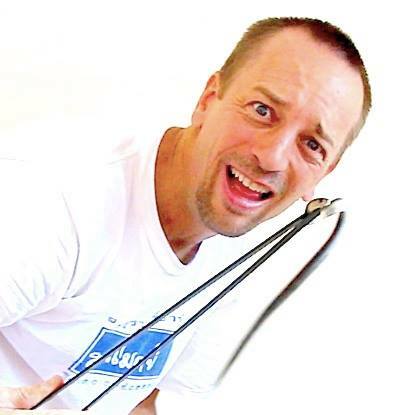 Catching monocled cobras with a bent up hanger. 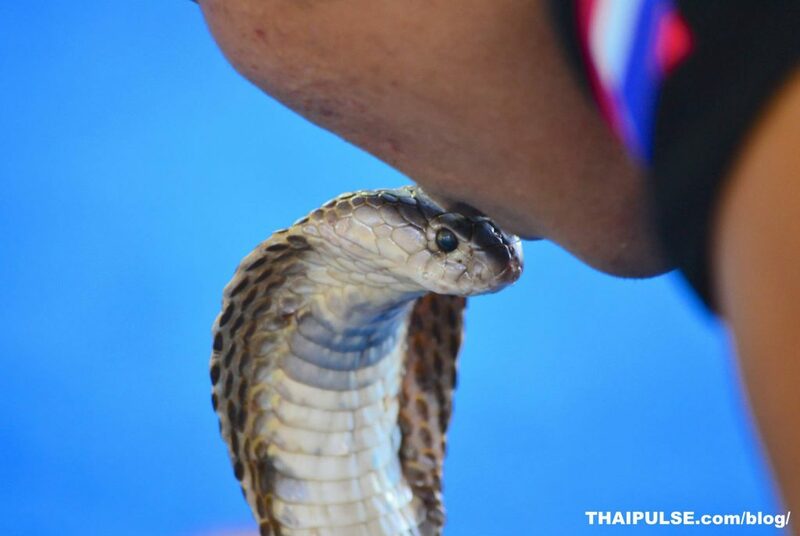 Same guy kissing a monocled cobra on the head. Olay from Burma. 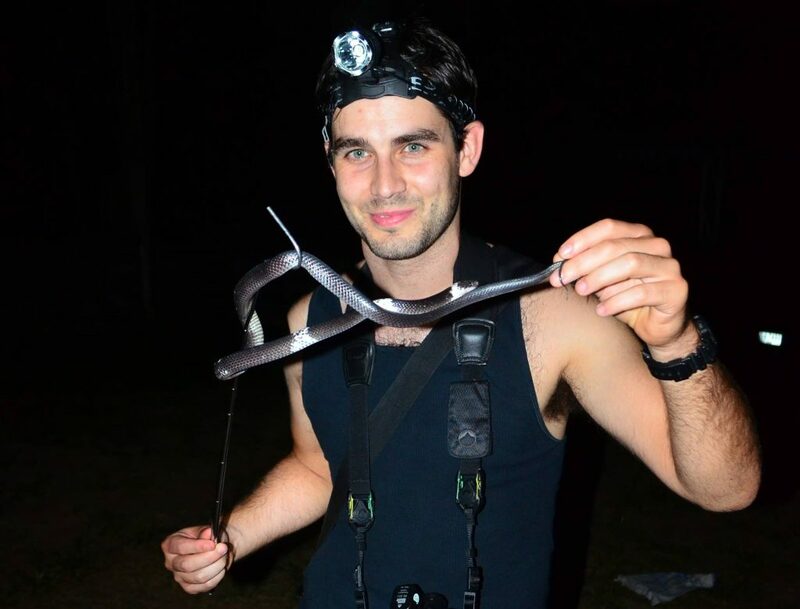 With a juvenile king cobra – Luke Yeomans. 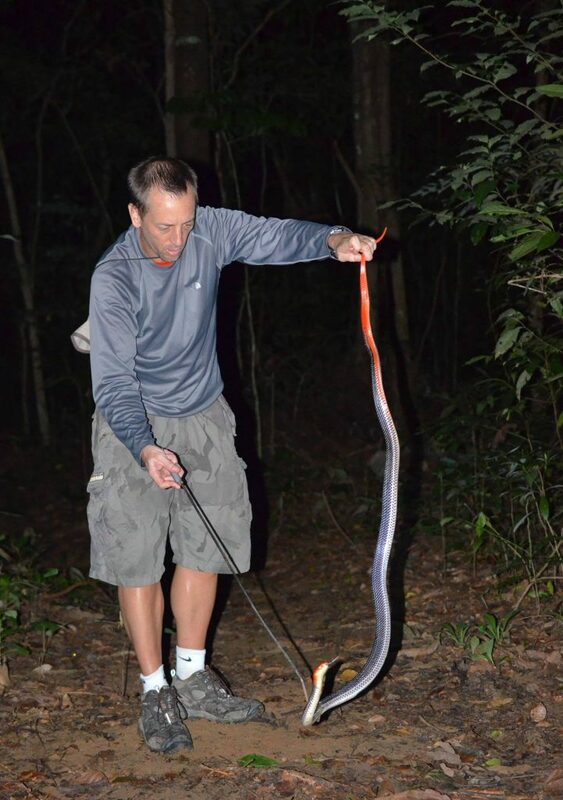 Showing some tourists the most deadly snake in Thailand, the Malayan Krait. 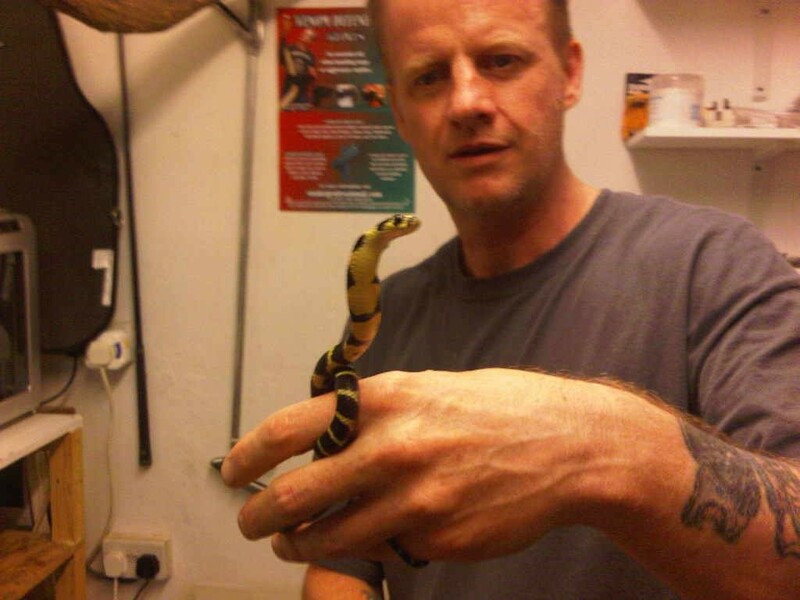 Rupert handling our huge red-headed krait. 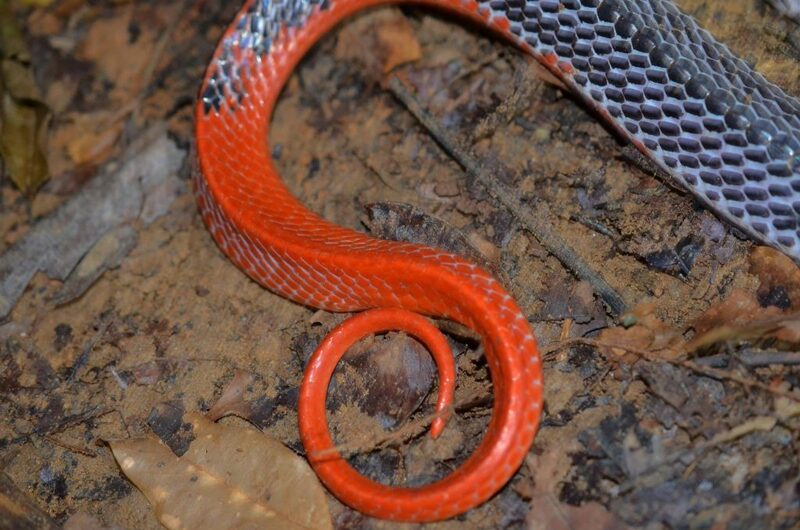 Full body shot – red-headed krait found in deep Trang rainforest. 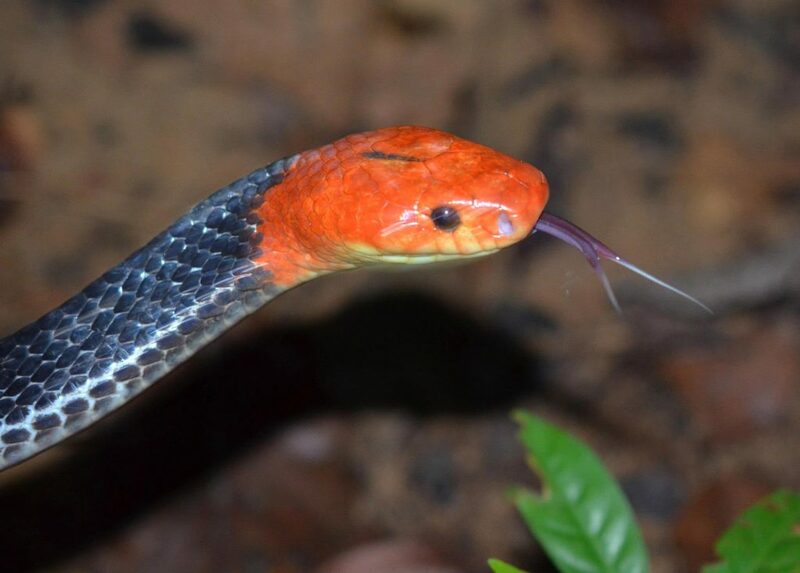 Black body, reddish orange head and purple tongue. Wish I had my better camera for this! 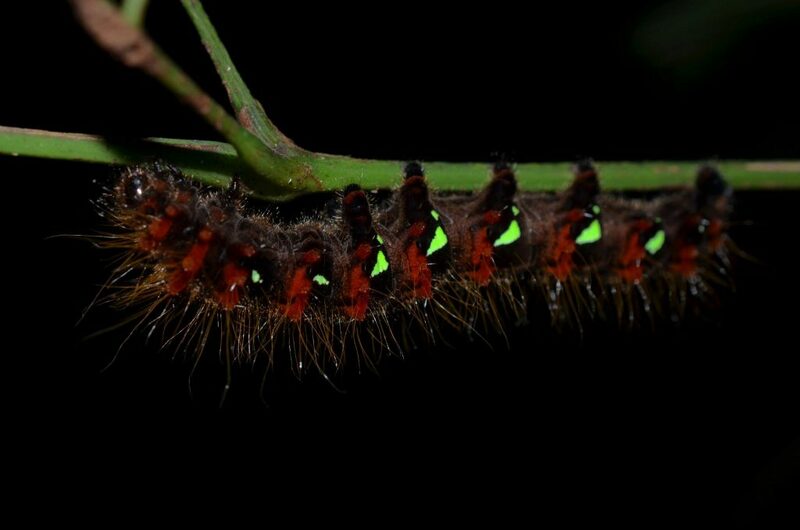 Caterpillar seen at night – venomous? 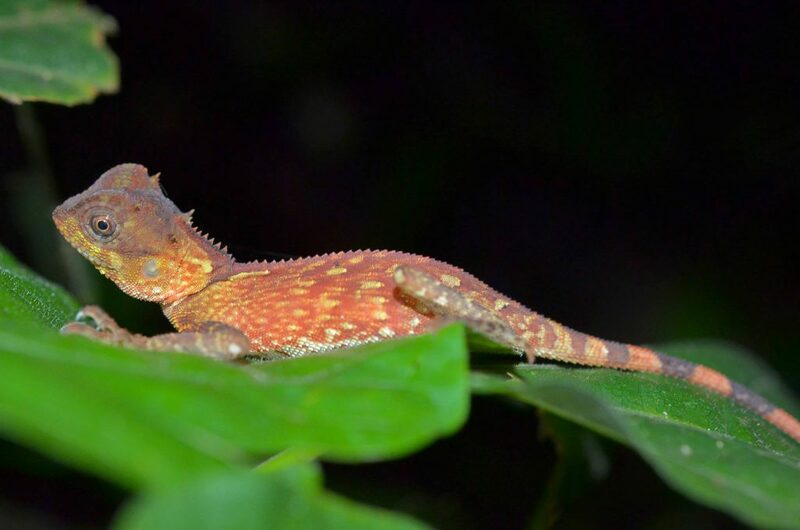 Love these geckos found in Krabi. 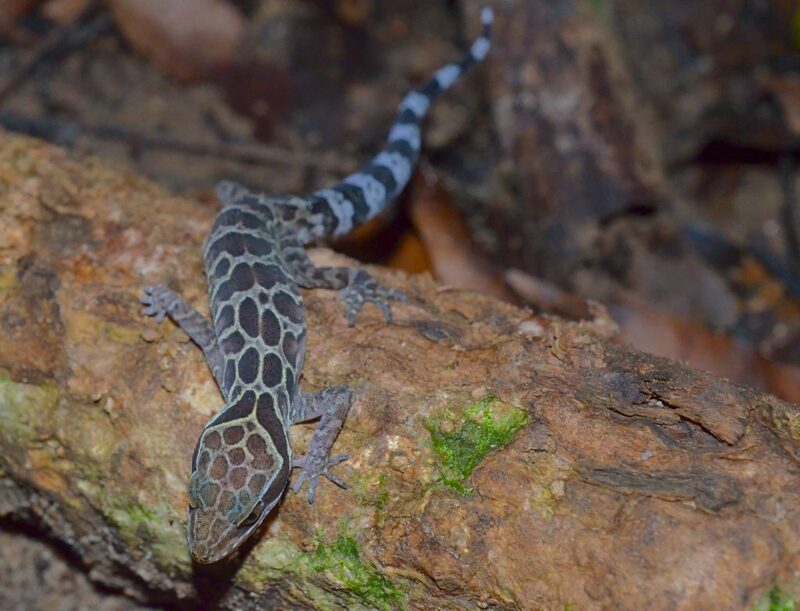 Some awesome lizards in Krabi, Thailand too. 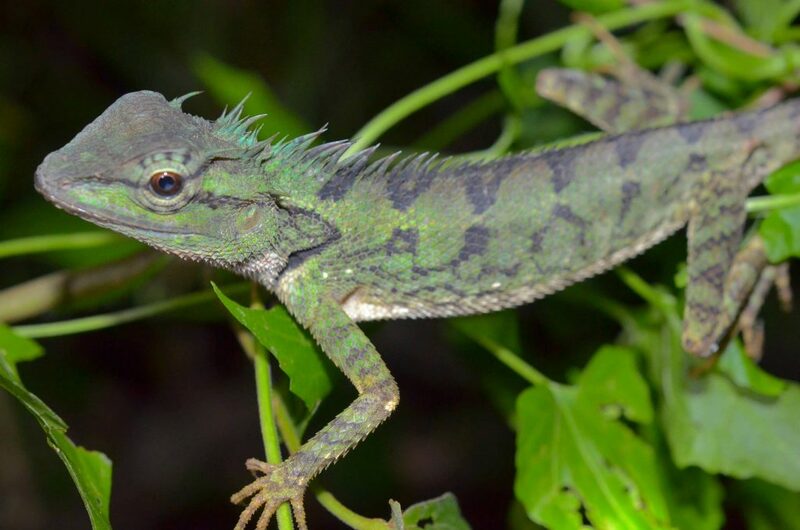 Calotes emma – mountain lizard, in Krabi, Thailand. 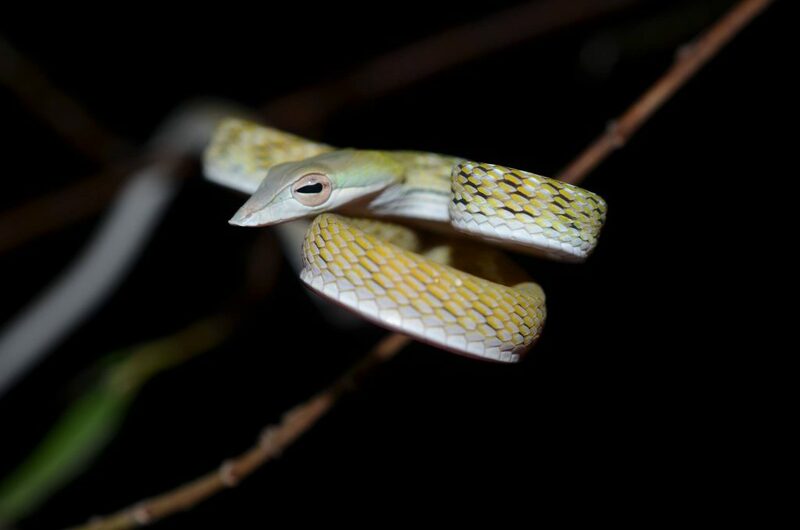 Yellow phase Ahaetulla prasina – Oriental Whip snake. 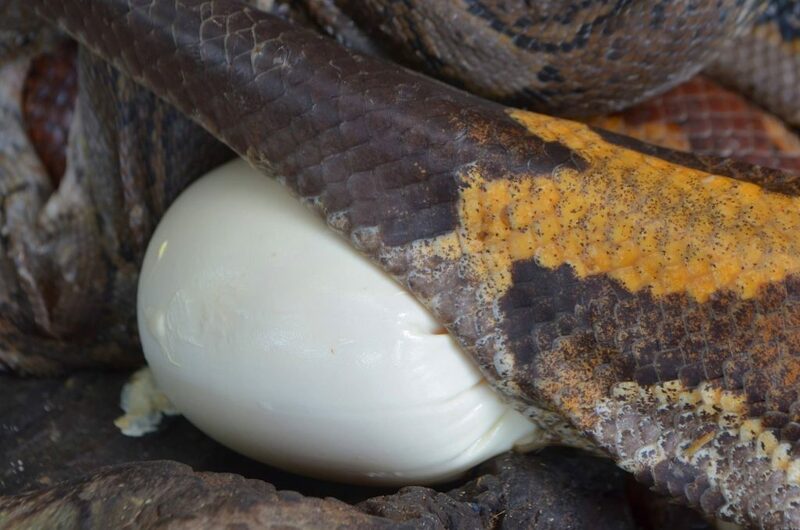 Bat catching snake – catches them out of the air. Elaphe ridleyi I think is the classification. 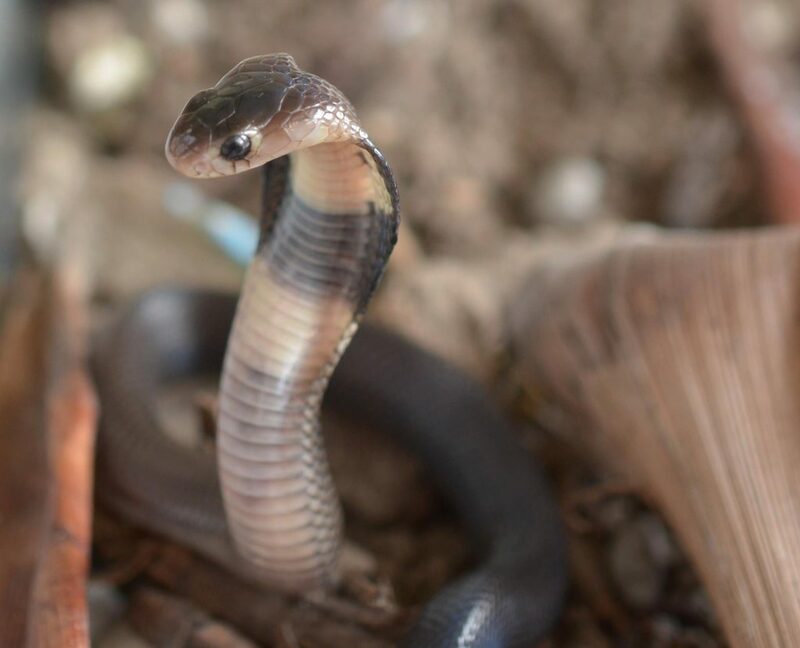 Monocled cobras are deadly even as juveniles. 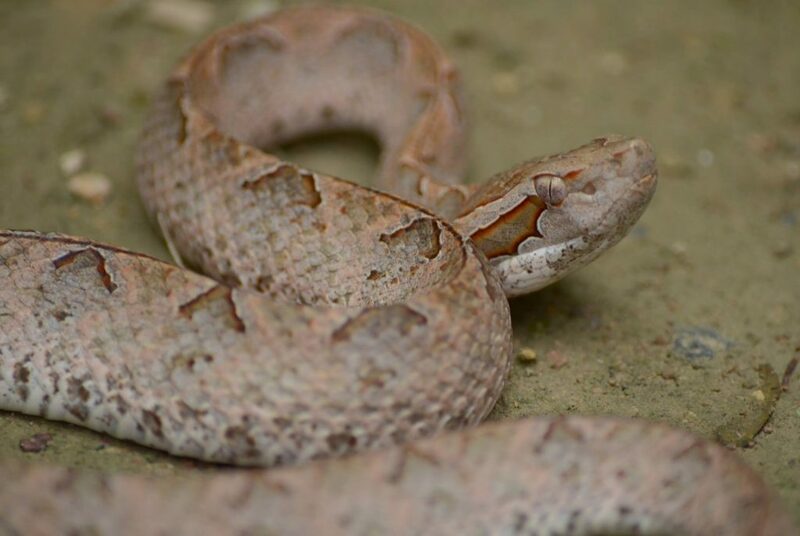 Malayan Pit Viper – deadly and very common on the ground at night. Use a torch (flashlight)! 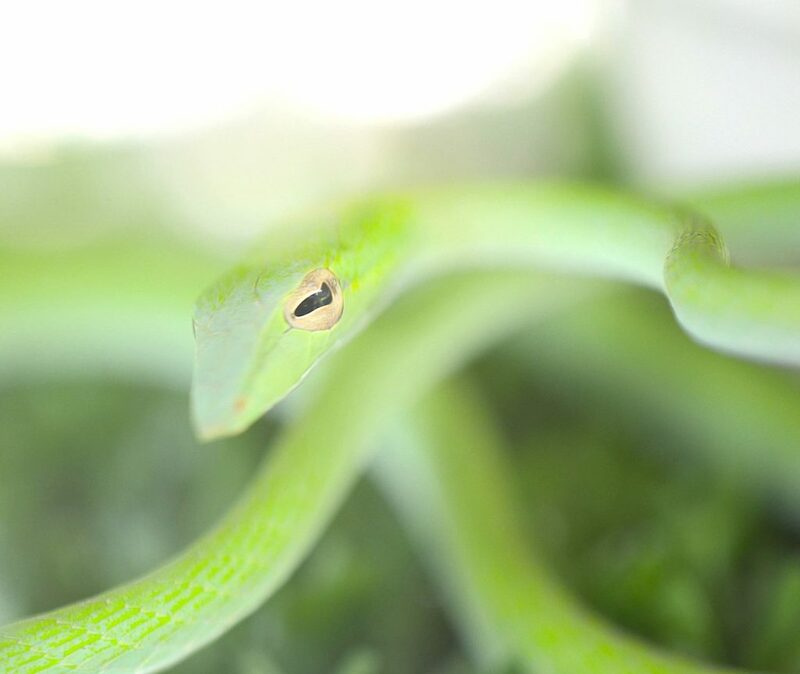 Green phase – Oriental Whip Snake. 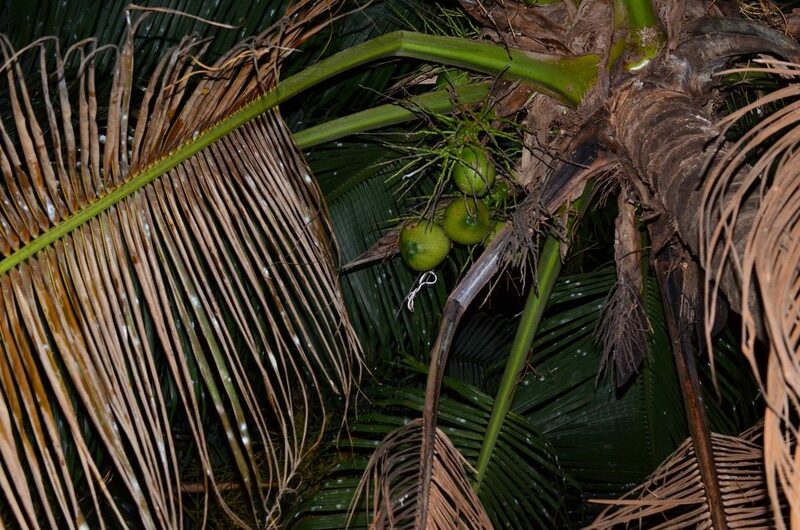 Like aliens! 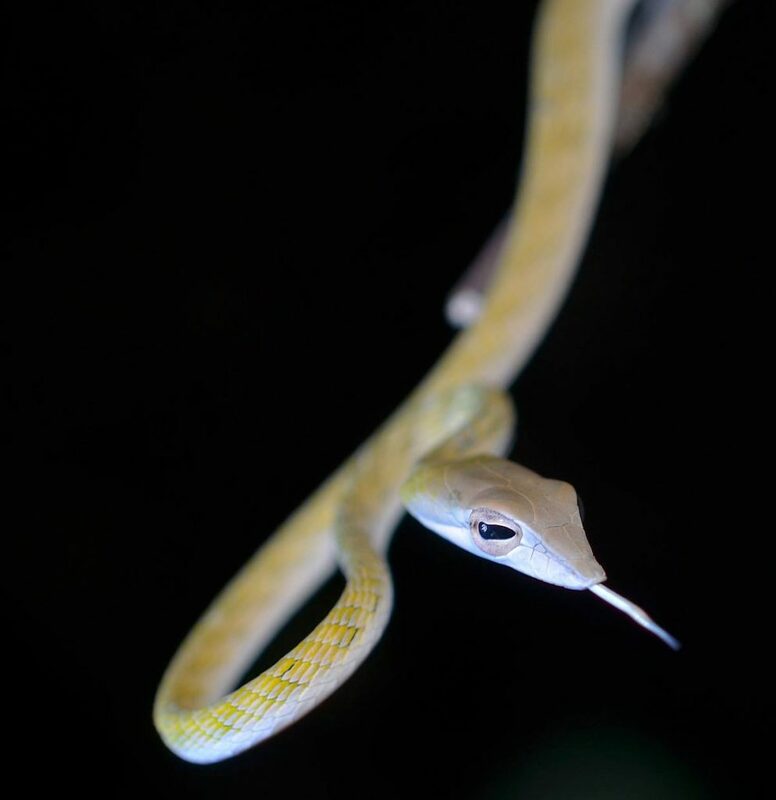 Yellow phase Oriental Whip Snake. 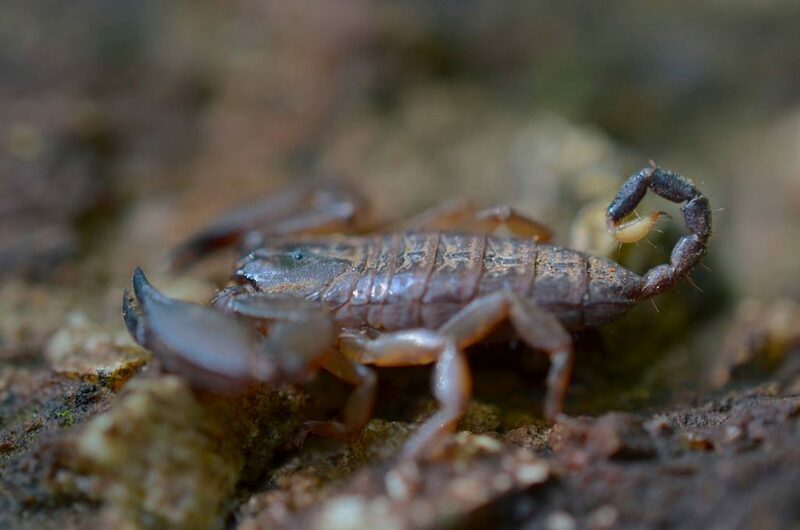 Scorpion found while hunting snakes. 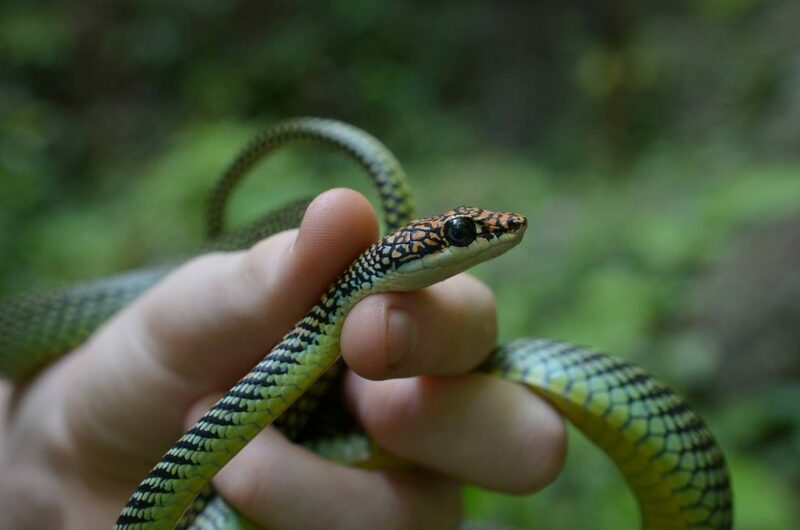 Yet another green Oriental whip snake. 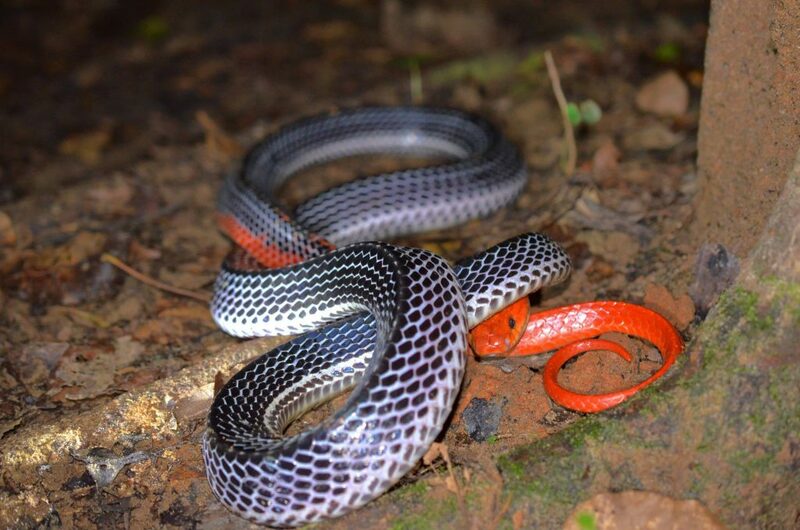 Chrysopelea paradisi – the Paradise Tree Snake, a lovely patterned snake found in Krabi, Thailand.